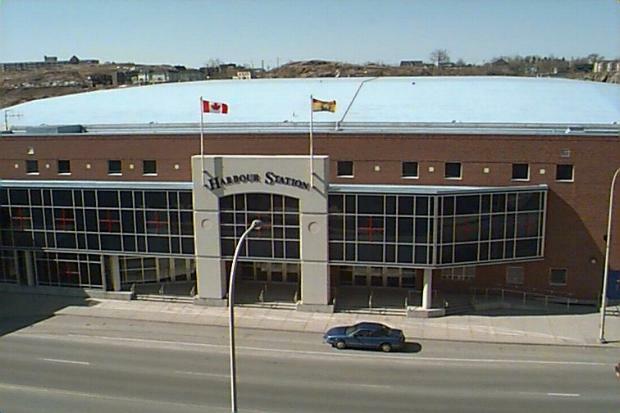 The venue is Harbour Station - an arena located in uptown Saint John, that serves for sporting events and concerts. It opened in 1993 and the seating capacity for concerts is about 7,200. Last edited by sturgess66 on Tue Apr 16, 2013 11:24 am, edited 1 time in total. So looking forward to this tonight. Driving down from Fredericton after work I have been going over his set lists and my absolute favorite "In my Secret Life" isn't played that often. Begging for a miracle he plays tonight!! "Oooh, bit of a setlist change in St. John." @andreguimond - The air is electric in anticipation of Leonard Cohen at Harbourstation. Lines coming in were packed. @NB2BC2NB - At Leonard Cohen. Many misplaced fedoras! 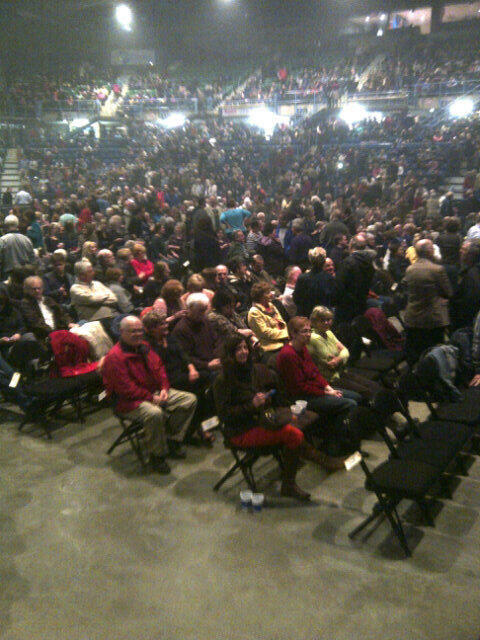 @McAlec - @harbourstation Any substance to rumour that Leonard Cohen is delayed? @HIESaintJohn - Nice to see Uptown buzzing tonight! 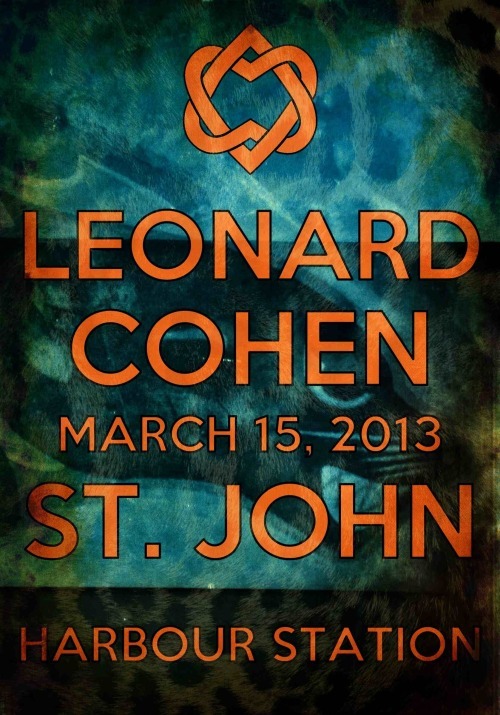 Welcome Leonard Cohen! 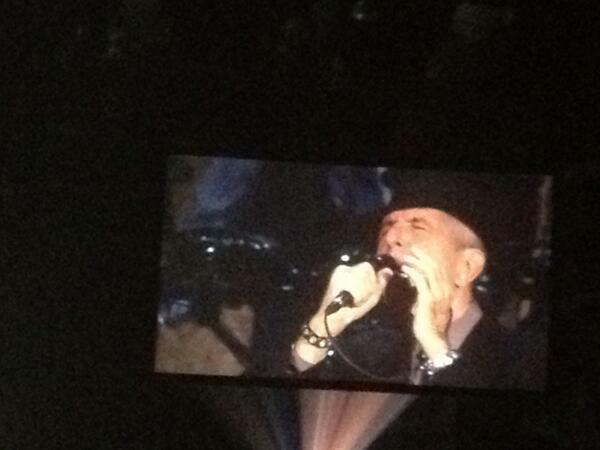 @KayMFG - Leonard Cohen is amazing! 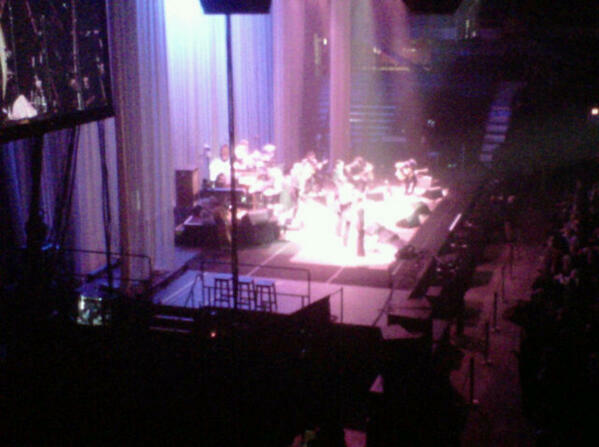 @HarryForestell - Leonard Cohen rules Saint John tonite! Great start to Old Ideas concert at Harbour. Station. @PAGForce - Leonard Cohen is totally worth a late night on a Monday night . Poetry should only be experienced this way. @shanemagee - filled with compassion & sympathy4 all the poor unfortunates who aren't listening to #leonardcohen live. #harbourstation is a liminal space! 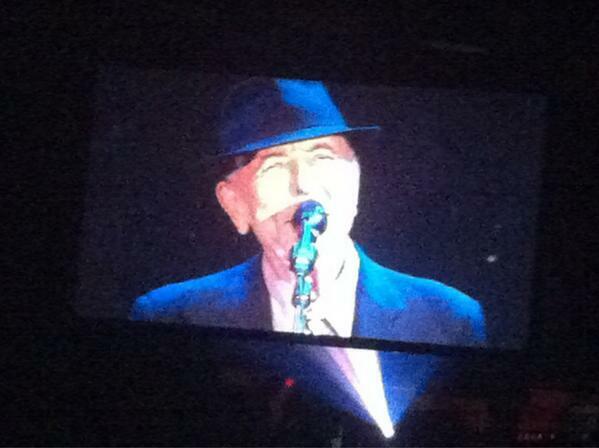 @BernardCormier - Leonard Cohen receives standing ovation & responds with encore! @hotaction - Leonard Cohen is gonna DJ his afterparty as "LC Soundsystem"
‏@stefanguimond- Anyone leaving Leonard Cohen going to the west side with an unused seat: I'm your man. @paullenarczyk - Pardon the cliche but #leonardcohen is still Canada's man. Fantastic show @LeonardOnTour @harbourstation Thanks! @SeaDogsDK - I feel richer for having seen Leonard Cohen tonight... refreshing to see someone love what they do and enjoy every second of it! Last edited by sturgess66 on Tue Apr 16, 2013 6:29 am, edited 2 times in total. It's a bit of a mugs game to compare shows but I have to say St. John is up there with all the other shows I have been to. The crowd was enthusiastic. Leonard was enjoying himself and so were we. He seemed in a playful mood. Great set list. As in Halifax, First we take Manhattan worked well in the first set. Leanord just keeps on getting better. Lets hope that his continuing and elaborated jokes about his mortality can be enjoyed for the many years he has left to live and perform. Even if he does start smoking again at 80! I have, I hope, several good videos (including 'Different sides' )which I will post. Last edited by cohenadmirer on Wed Apr 17, 2013 5:36 am, edited 1 time in total. Looking forward to them David. Glad to hear that the concert was great. Thanks for the "live" concert report David. If the atmosphere was anything like Halifax, it will have been fantastic! What was the set change Leif referred to? Can you post the list on the Setlists thread? Someone please correct me if I'm wrong, but the Saint John audience saw the premier performance of "Different Sides". And it worked well. Between Halifax and Saint John we got 7 songs from Old Ideas. This is likely what Leif was referring to. Also, in 2013, Alex now has a major role on stage with violin featured in many songs and finding a part in virtually every song. Mabeanie1 wrote: Thanks for the "live" concert report David. If the atmosphere was anything like Halifax, it will have been fantastic! Yes, the concert was fantastic, with a crowd and an atmosphere comparable to Halifax. We heard Different Sides instead of Heart With No Companion. No Tried to Leave You. I am really looking forward to Moncton--to my mind, these first two Maritime shows have both been standouts. Steve Wilcox wrote: Someone please correct me if I'm wrong, but the Saint John audience saw the premier performance of "Different Sides". And it worked well. Between Halifax and Saint John we got 7 songs from Old Ideas. This is likely what Leif was referring to. Hi Steve, Just saw your post. I think you are right that it was the premier performance for 2013 (and maybe also the debut for North America), but it has in fact already been performed in Europe. In any case, it was a lovely surprise last night. I can't remember off the top of my head which concert but Different Sides was definitely performed at one of the Toronto concerts last year. I stand corrected on the "Different Sides" world-premier comment. I was pleasantly surprised at the turn out in Saint John. The official count for Halifax was 12,000 and that I expected. But the strong showing and responsiveness of the SJ audience was a wonderful surprise. And, I felt Leonard truly did give us everything he had. Like Halifax it basically went from 8:15 to 11:42 and the intermission did not lag. It appeared to me that the average age was at the upper end of the scale and I think by the time it ended most were satisfied. People should actually read the ticket they paid dearly for - "On Stage Promptly at 8:00".